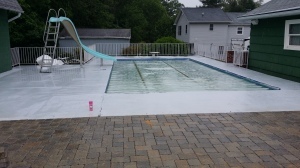 This entry was posted on Friday, June 19th, 2015 at 2:31 pm. 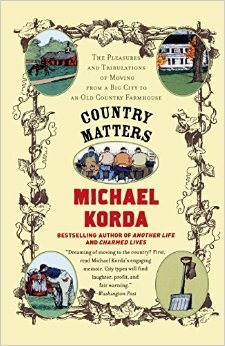 After reading Michael Korda’s Horse People, I purchased Country Matters, which was published two years before Horse People, and details the big move from the city to their fixer upper farmhouse in the country. It is a very in-depth look at their house, the renovations, and their new town. Also, it’s answering quite a few questions I had when reading Horse People, which is always nice! Now that our farm sign is up, I want to plant some Black Eyed Susans around it. Also, our patio/retaining wall project is probably 65% complete, so I am thinking about how I’m going to ‘pretty up’ the area. I have a love/hate relationship with planting flowers and gardening. I love being outside and doing work around the yard, but I don’t particularly love this type of work. I’d rather be mucking stalls. For the 4th of July! This will be our second year hosting a large party, so of course there is so much to do beforehand! James is hanging the closet door in the mudroom, so minus finding a reading chair, that room is finished. And then there’s just lots and lots of cleaning to be done – need to make the place look presentable!